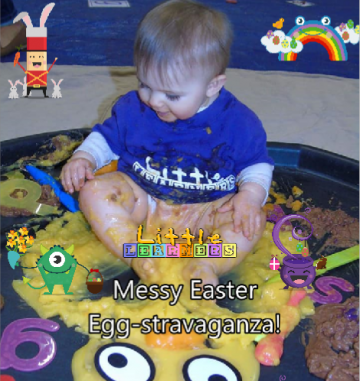 A Messy Easter Egg-Stravaganza Cooksbridge! SOLD OUT! Only valid when purchasing a full price child ticket. Only available to brothers/sisters of full paying child. Little Learners Award Winning Cooksbridge Messy Play Classes for Babies, Toddlers & Preschoolers. Encouraging Children to Mark Make & Learn Through Play! This event has now sold out! Please email kate@littlelearnersuk.com to be added to the waiting list. Join us at Beechwood Hall, Cooksbridge on Tuesday April 9th, 10.15 – 11.30 am for a very special Messy Easter Egg-Stravaganza! This event is aimed at children aged 5 months to 5 years, but older and younger siblings are more than welcome too. We’ll have lots of Easter-themed messy play as well as our usual mark making stations, including paint and play dough, so there’ll be something for everyone. There will also be a special Easter Egg name finding hunt with a chocolatey prize! I hope you can join us!